The self-help classic Thoughts and Feelings adapts CBT techniques into a powerful program that has benefitted thousands of readers by helping them overcome the emotional and behavioral challenges of everyday life. 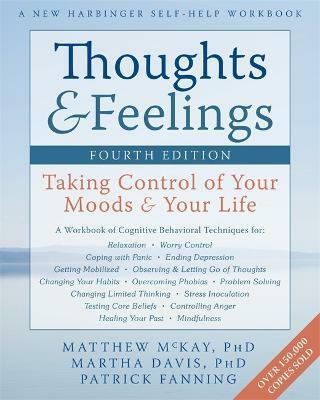 This workbook shows readers how they can identify and change the irrational recurring thoughts that can lead to anxiety, anger, depression, and obsessive thinking by replacing these negative thoughts with new, constructive thoughts and behaviors. Readers discover how to distance themselves from unproductive negative thoughts and learn to identify their core values so they can use these values as a road map to emotional stability and life satisfaction. This revised edition includes the latest statistics and research on depression, anxiety and panic, OCD, anger problems, stress and phobias. It also offers new cognitive defusion and values-based behavioural activation techniques drawn from acceptance and commitment therapy (ACT). --Thomas F. Cash, PhD, professor emeritus of clinical psychology at Old Dominion University in Norfolk, VA "A jewel of a book: supportive and empathetic, short on platitudes and long on practical applications. A must-buy for all cognitive behavioral therapists." --Thomas E. Ellis, PsyD, ABPP, professor of psychology at Marshall University in Huntington, WV "One of the most comprehensive and empirically sound guidebooks in all of self-help literature. All of the major problems in living are covered." --Cory F. Newman, PhD, clinical director of the Center for Cognitive Therapy and associate professor of psychology in psychiatry at the University of Pennsylvania "An excellent resource, reference tool, treatment manual, therapy coach, and compendium of techniques." --Arthur Freeman, EdD, ABPP, HSPP, president of the Freeman Institute for Cognitive Therapy and director of clinical training and supervision for the Center for Brief Therapy in Fort Wayne, IN "An outstanding book. I recommend it without reservation for both general readers and therapists. It stands apart from other similar books in its reliance on scientific data, not fad, hype, or mysticism." --Jacqueline B. Persons, PhD, director of the San Francisco Bay Area Center for Cognitive Therapy and clinical professor in the Department of Psychology at the University of California, Berkeley "Chock-full of systematic strategies for the treatment of a wide variety of psychological problems. Eminently readable and helpful for professionals as well as patients."